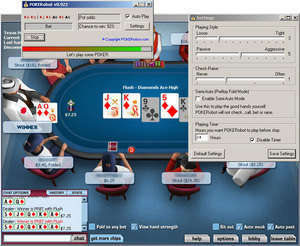 POKERobot is both an auto playing poker robot and an online texas holdem stats calculator. It displays your chance to win and suggests what action you should take, preflop, turn and river. You can adjust it's playing style and select from 3 modes of play: full-auto, semi-auto and odds calculator mode. No-Limit Holdem play is possible in semi-auto mode. For security reasons, you should also check out the POKERobot download at LO4D.com which includes virus and malware tests. Additional screenshots of this application download may be available, too. POKERobot has a presence on social networks.